Ceiling designs can be brighten up with modern wallpaper that add texture and color, interesting patterns or pleasant images. Ceiling decorating with modern wallpaper is a great choice for those who likes to create modern interior design while balancing rooms dimensions. 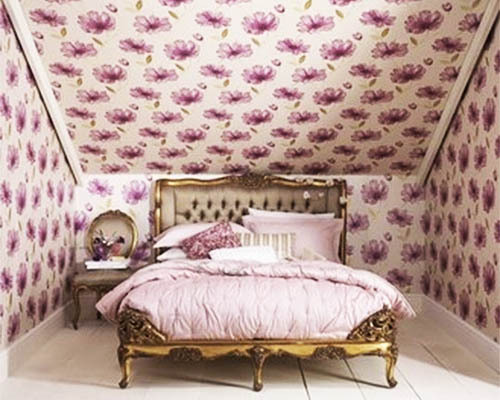 Ceiling decorating with modern wallpaper patterns and images adds texture and stylish colors to ceiling designs. Modern wallpaper patterns and photo images dramatically transform home interiors, making room decorating more interesting. Ceiling decorating with modern wallpaper is an unusual way to bring your favorite theme into interior decorating and balance your room proportions, making the ceiling look lower in the room that feels wider. 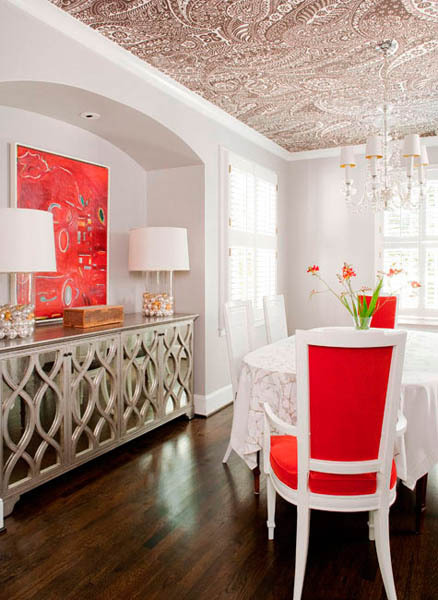 Ceiling designs with modern wallpaper patterns and attractive textures look stylish, bringing more attention to the upper part of the room, emphasizing unique architectural features. 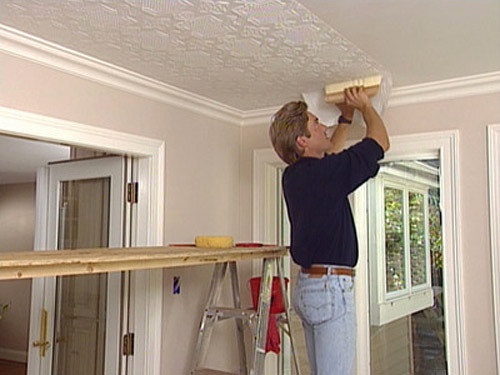 Ceiling decorating with modern wallpaper is excellent for creating more attractive and looking smooth ceiling surface that has small inperfections, bumps and tiny cracks. Any type of wallpaper can be used for creating beautiful ceiling designs. Ceiling decorating with wallpaper is not difficult, but you need carefully choose color, texture and modern wallpaper patterns for our interior design project, because removing and changing wallpaper is not so pleasant job. 15 ideas for ceiling decorating with modern wallpaper, offered by interior decorating expert, may inspire you for create stylish and unique ceiling designs in you home and beautify your interior design. Modern wallpaper is a gorgeous way to adorn your walls and create amazing ceiling designs. White stucco has been the standard for far too long, creating plain, lacking interest surfaces. Modern wallpaper patterns and trendy color combinations bring new opportunities into ceiling decorating. Beautiful wallpaper adds pleasant images, like flowers or light clouds, colorful patterns or expressive textures to your ceiling designs, and it will undeniably enliven the room decorating. 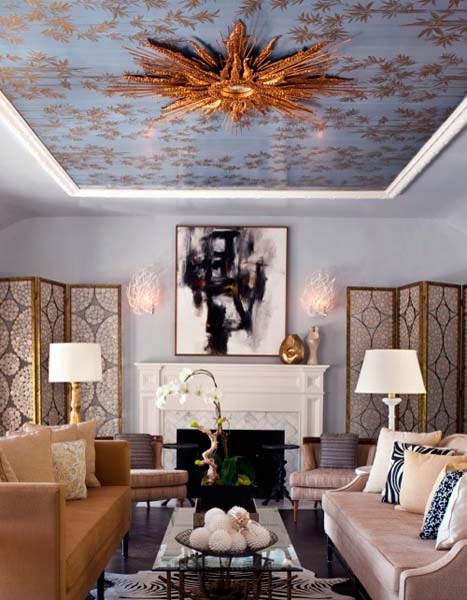 Hand-painted or textured ceiling designs look fabulous, and beautiful wallpaper allows to achieve the same effect. The earliest known fragment of European wallpaper that still exists today is in Cambridge and it is on the ceiling. Beautiful wallpaper celebrate architectural features, emphasizing the charm of an old house, or give life to the boring box in a contemporary home. Beautiful wallpaper on the ceiling dramatically change modern interior design. Ceiling decorating with wallpaper maybe is not for every room, but in the right space it will elevate your interior decorating in every sense of the word. Here are ideas for ceiling decorating with wallpaper and the best ceiling designs from aound the world. Get inspired and ready for ceiling decorating with modern wallpaper, exploring this wonderful technique of creating remarkable ceiling designs.